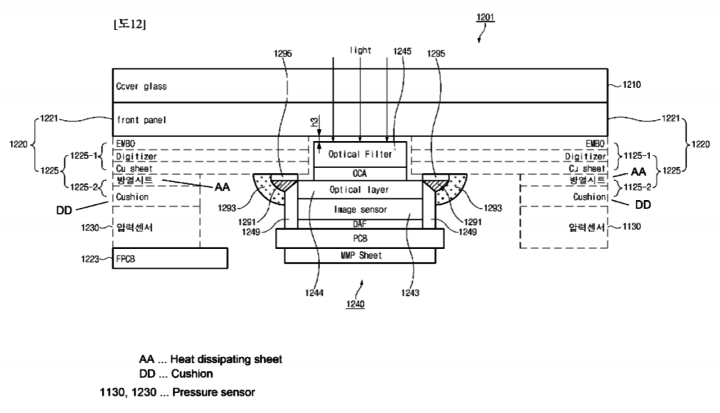 A patent application from Samsung shows us how an optical fingerprint scanner might be placed under the Galaxy S10 display. Though this is not the first time we see a similar patent, it is the most advanced implementation so far. Rumors about Samsung flagship phones having an FOD (Fingerprint-On-Display) scanner go back years. When the Galaxy S9 did not have one, it was believed the Note 9 might. When that device did not have one, rumors pointed to new mid-range devices and ultimately to the Galaxy S10. But while Samsung could well opt to use a sensor by a different manufacturer, its own R&D department does not sit still. Today, the WIPO published a patent application titled ELECTRONIC DEVICE COMPRISING BIOMETRIC SENSOR. It was filed there earlier this year, but the original Korean patent application dates back to April 2017. What we see is an optical sensor embedded under the display of a recent looking Galaxy device, unlike similar patents that showed far more abstract implementations. The general area of the sensor is pressure-sensitive, just like the virtual home key on Galaxy S and Note models. 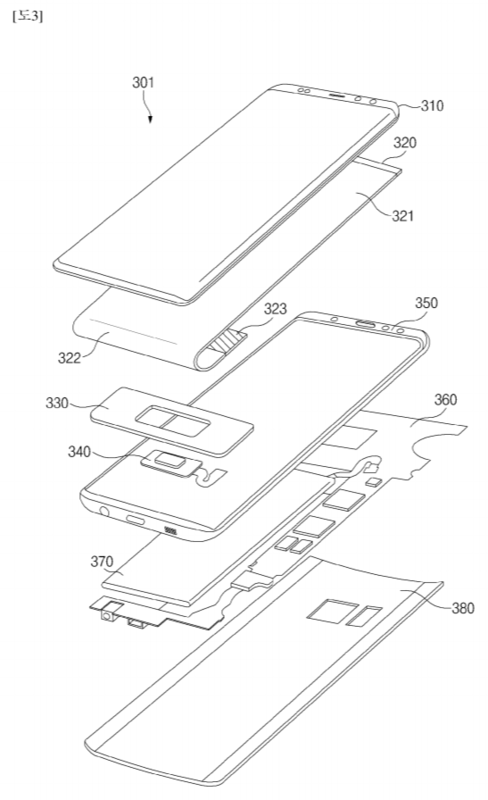 Mind you, the date of the original filing excludes the possibility of drawing conclusions about the upcoming Galaxy S10 design, even if that bottom bezel looks rather tiny. Nevertheless, this could well end up being the way Samsung implements its own in-display fingerprint reader in upcoming phones, no matter how they look. Interesting the display is curved underneath like the iPhone which uses this to get rid of the chin which also means some more milimeters of thickness but at the same time the patent also shows a chin. But again it’s a patent drawing to show the patent itself so the final phone design it self could look a bit different. Wow I’m glad there isn’t a Notch. We can’t ignore the screen here. The bottom is curved back like the iPhone X. Possibly meaning the S10 might not have a chin like the iPhone. If that patent application has just been made now it will not be on a device in just 5 or 6 months time. The patent acceptance time is about 4 to 6 months. I know, I made patent applications for engineering products! Not saying there’ll be no underscreen fingerprint sensor on the S10, I’m sure there will, but it won’t be this phone. The S10 is most definitely already in prototype and has been for months. This one was filed in 2017 in Korea initially, so could be the S10 or couldn’t. Yes, if it was 2017 then it is very possible!